Wise Old Women Design is a small company that believes hard work pays off. 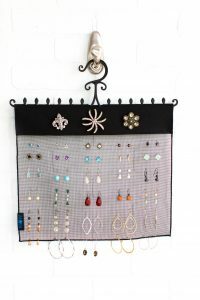 One and a half years into this project with a lot of work our simple jewelry hangers are becoming a big seller. We spent the past year traveling to several Women’s trade shows across the U.S.A. proving the concept of our product. In January 2012, QVC found WOW Hangers and gave us a chance to air our products. 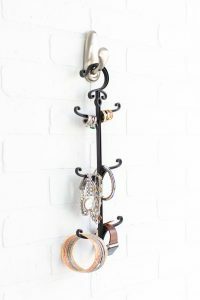 The Wow Jewelry Hanger was a big hit. QVC has sold out of our products. QVC placed another order in March, however due to the success of the ASD Las Vegas Show, we decided to take our company in another direction and are currently selling them in Independent Hallmark stores, and boutiques throughout the USA and Canada. Many thanks to the people and customers of QVC! This March we went to the ASD trade show in Las Vegas. This was the first show we went to of it’s kind. I wasn’t sure what to expect, but what we found was this idea was successful. We found new customers to carry our product in their stores throughout the country. It felt really good to say we are a made in the USA product. So many people really supported us because of this. From small boutiques, hair salons, gift shops, and many other types of stores. All of these buyers are independent owners of their stores and were able to see value and potential in our product. Many, many thanks for all the great people we met at ASD in March, and we are here to support their stores now. This is a new direction for us and we are happy to be learning something new! Just what I’ve been looking for! I love these. I bought those removable adhesive hooks and hung them behind my door. I used all four for necklaces and bracelets as I don’t need any more earring space. These are wonderful. 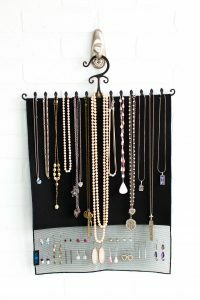 I can now hang each necklace on it’s own hook and I can see everything. This is perfect. It’s just too bad I couldn’t give it ten stars because I would have. 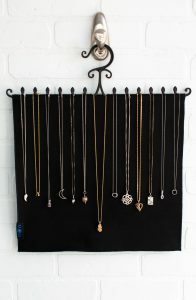 I just received the two necklace hangers and want to tell you how pleased I am with your product. This is a present for my daughter and is exactly what we were looking for. Your order was processed immediately, and the shipping information kept me up to date on when it would be here. This is so WONDERFUL!!!!! I purchased two bag fulls from you at the ASD show in Vegas last month and I’m getting to promote them on my website. I would like to use this story to promote the hangers. Also, I received my DVD in the mail last week. Thanks!